Are you looking for a waterfront accommodation that will be beautiful, luxuriously furnished and where you will have enough privacy? 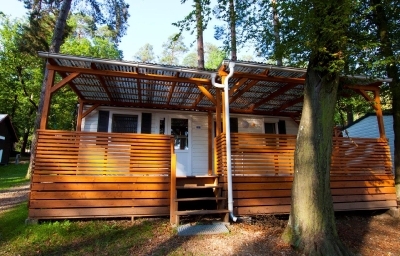 If you want something special, you can definitely try out our new Mobile Homes provided with above standard facilities. 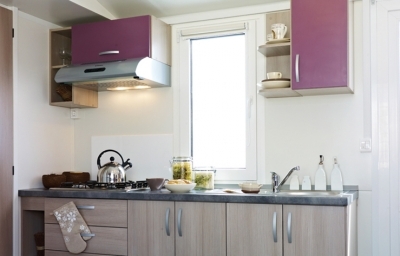 Luxury mobile homes s are perfectly prepared for hot summer days. At a time when others will sweat, you will safely protect your private air conditioning from the unpleasant heat. If you feel like enjoying a pleasant private get-together, make yourself comfortable on the large, covered terrace and take a cool chilled drink or ice cream from the fridge or freezer. 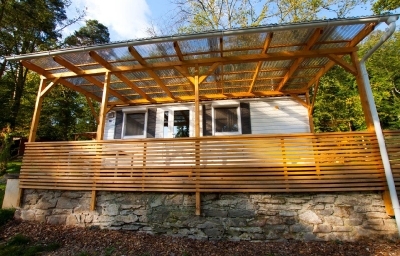 Each mobile home, or bungalow, is equipped with one, two or three separate rooms with two beds with bedding and linen, bedside tables with lamps and wardrobes. Of course, there is a digital TV, a fully equipped kitchen – a ceramic hob, a sink with hot and cold water, dishes, a fridge with a freezer, a microwave oven, a kettle. There is of course a private shower and a toilet. In the dining area you can divide the seat and get another bed. Car parking is provided near the mobile homes. Lunch and dinner are offered In GAUDEO restaurant by selecting from the menu. boats, pedal boats, electric boats, water football, aquazorbing, rope park, sports equipment rental, use of washing machines, dryers, etc. The pricelist is valid from 1.1.2019, the price change is reserved. All prices are in CZK, including VAT. "Under the Sales Records Act, the seller is required to issue a bill. At the same time, he is obliged to register the received revenue with the tax administrator online, in the event of a technical outage not later than within 48 hours." 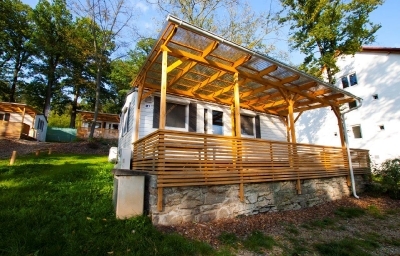 The Campsite Operating Rules shall apply to the designated area for tents, caravans and accommodation units (mobile houses, cottages, guesthouse “Na Stráni”, guesthouse “Gaudeo”, apartment cottage “U Mostu”) at the Vranov Dam and the Campsite, which is operated by Vranovská pláž s.r.o., Mladoňovice 65, VAT No . : CZ28342259; and Gaudeo - Vranovská pláž s.r.o., Mladoňovice 65, VAT No . : CZ02162695. Only a citizen who will properly check in at the reception at the entrance, present an identity card and pay an accommodation fee, can be put up at the campsite area. Everybody in the tent or caravan will receive a registration number to be visibly attached for permanent control. The accommodation provider may, in special cases, allot a guest the accommodation that does not basically depart from the order, even if the order has been confirmed. The order which has been confirmed by the accommodation provider may be cancelled or changed by the customer without cancellation fee, at least 60 days before the announced arrival date. On leaving the premises and returning back, the guest will produce his/her permanent card with a valid residence card. The use of the campsite is only allowed to citizens who are not germ-carriers or infected with infectious or parasitic diseases or who are not required to have increased health surveillance or quarantine. If the accommodation is not agreed otherwise, the stay is valid from 3 pm. The guest is obliged to leave the accommodation unit no later than 9 pm on the day of the end of the stay, the space for tents and caravans no later than 12 pm. If the guest fails to meet this deadline, the accommodation provider is entitled to charge the price of the accommodation for the next day. A guest checked in before 6 am is required to pay the accommodation for the whole night. The accommodation is paid in advance. At the end of the stay in the accommodation unit, the guest must turn off the lights, close the water closures, close the windows and doors and give the key to the manager of the accommodation unit. The guest has the right to use all facilities of the accommodation unit and the services of the accommodation provider. In the accommodation unit, the furniture cannot be moved or otherwise changed without the consent of the company's manager. Citizens staying in the camp are obliged to take care of cleanliness and order, to build tents and to park vehicles only in the spaces reserved for that purpose. They are obliged to comply with the Decree of the Municipality of Štítary and Vranov nad Dyjí and the Decree on the zone of hygienic protection of water resources. The guests are required to dispose of municipal waste only in designated containers in dedicated locations. Other waste is not allowed to be stored anywhere in the campsite. Night time should be observed between 10 pm and 8 am. At the time of cultural events, the night-time is changed from 1 am to 8 pm. Fire production is only permitted at places reserved and properly designated by the campsite operator. Vehicle washing and maintenance is strictly prohibited throughout the area. Vehicle parking in the zone of hygienic protection of the water source, even for a short time, is forbidden. All visitors and others residing at the Vranov Beach and campsite area may park their motor vehicles only at designated locations, based on the consent of the Vranov Beach and campsite operator. The Vranov Beach and campsite operator reserves the right to tow away a car that is parked in violation of this arrangement, i.e. in a place not reserved for parking and on the basis of consent. 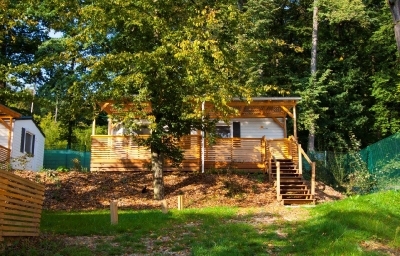 The use of its own beer and limo beverage facilities, including the consumption of its own beer barrel, is prohibited throughout the Vranov Beach and campsite, including accommodation units. The guest is responsible for damage caused to the property of the property owner according to generally binding regulations. In accommodation units it is not allowed to use unauthorized el. appliances. For safety reasons, it is not allowed to leave unaccompanied children on the premises of the property owner. Dogs and other animals are forbidden to enter the premises of the accommodation provider, the entire campus and accommodation units. The accommodation provider is liable for money, personal papers, and other valuable items only if those have been handed over to him for safekeeping. The accommodation provider is not liable for the things freely laid aside elsewhere. 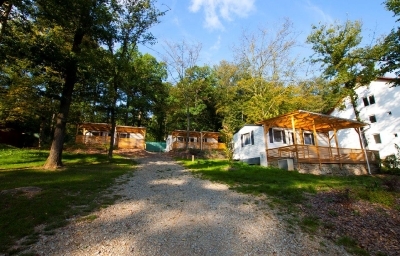 All guests acknowledge that the campsite is monitored by the camera system of the campsite operator and therefore all guest acknowledge that they can be monitored by this camera system. All guests must familiarize themselves with these Operating Rules which must be observed by them. Having paid for the accommodation or entrance tickets the guests declare that they have been familiar with these Operating Rules. The Operating Rules of the campsite are binding for all those staying on the premises of the Vranov Beach, campsite and accommodation units. Any person who violates the Operating Rules of the campsite will be banished without compensation from the premises of the Vranov Beach, campsite and accommodation units. In the event of damage to or destruction of the property of the facility, a minimum amount of CZK 500, or the actual amount, will be exacted. Upon premature termination of stay by the guest, the accommodation provider will return the money only on the basis of a medical report. The guests are obliged to comply with Decree No. 4/1998 of Vranov nad Dyjí, otherwise they may be banished, and agree that their vehicles can be towed away at their expenses.